Effective Jan. 1, 2019 - all dogs will be required to be up to date on Influenza vaccine as well. Please speak to a staff member with questions. 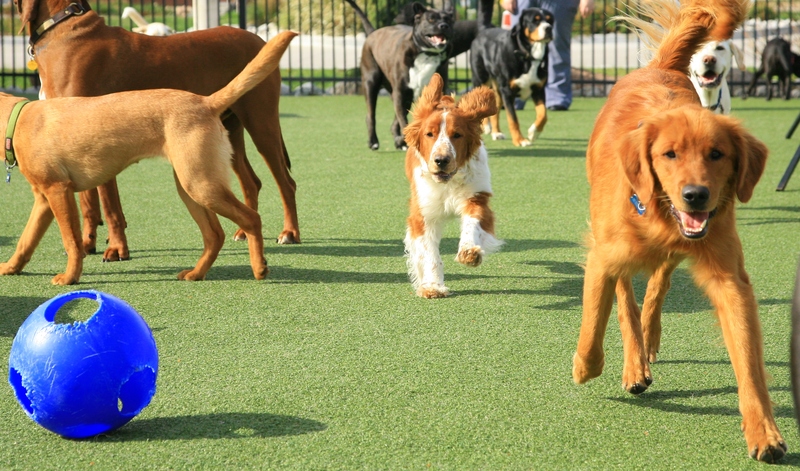 Doggie Day Care with a focus on fun, exercise and manners for all of our canine companions. We have a 50 x 100 square foot fully fenced astro-turf play yard providing lots of room for your dogs to romp and play. The best part - an indoor swimming pool for daycare and lodging visitors to make this the most fun place for dogs to come for the day and go home happy. All Daycare pricing includes webcam access (through a mobile app) indoors and out, including the pool webcam! HOURS: Daycare is open Monday through Friday from 7am-5pm, and Saturday 7am-4pm. for your convenience. You may pick up Monday-Friday until 7pm, however, dogs will be kenneled once daycare closes. During the day your dog will receive supervised playtime, along with periods of rest. We do not feel it is good for most dogs to play for the entire day as they can often get over tired and grouchy, so nap time is a way for them to chill out, rest and get ready for another round of play. Your dog may be kenneled for about an hour in the morning and in the afternoon. Around 5:00pm Monday-Friday we start putting dogs up for the day, and daycare is over at 5:00PM (on Saturdays, we close at 4). We then start cleaning and preparing the daycare space and yard, but pickups are still available until we close at 7:00pm. Any pickups later than 7:00pm will be subject to a $14 late pickup fee. We require the following vaccines to be up to date: Rabies, Distemper, Parvo, Bordetella, and Influenza. We also require you to fill out our New Client Form, our Dog Tales Activity Consent Form, and our Daycare Questionnaire; all available on this website. At Advanced Animal Care of Colorado and DOG TALES Activity Center we care a great deal about the health of all of the pets we care for, their owners, and the staff that handle these pets. We have seen an increased number of Giardia cases in Fort Collins and we feel a need to educate our clients regarding this disease. We have implemented a program to prevent our facility from being a host to this parasite. Please read through this information and let us know if you have any questions or concerns. If you notice soft stool or diarrhea in your pet – please notify us immediately or request your veterinarian to check your pet’s stool for this parasite. We would like to work together with all of our clients and your veterinarians to ensure the health and safety of the pets that attend AACC and DOG TALES!